It’s been a pretty good couple of months for King — first a ConfCarolinas championship and now landing home matches versus likely top-10 ranked teams. King announced during the weekend that it will open the 2019 season with home non-conference matches against both Lewis on Jan. 11 and Loyola on Jan. 12 in Bristol, Tennessee. This will be the first time that King will play host to a nationally ranked team since losing to Lewis in its 2011 season opener. Both the Flyers and Ramblers concluded the 2018 season ranked in the top 10 of the national coaches poll and national media poll. In addition, King suffered road losses to the two teams during a Midwest road trip in March. The Tornado ended last season with their second consecutive 20-win season and won their first ConfCarolinas championship in program history to qualify for the NCAA Tournament. While King loses three all-conference starters from that championship team, all-conference middle attacker Jon Wheaton returns for his senior season. Lewis and Loyola each have All-MIVA starters coming back this upcoming season. Setter Garrett Zolg, the 2018 MIVA Freshman of the Year, helped guide the Ramblers to a share of the MIVA regular season championship. Loyola also advanced to the MIVA Tournament finals — its deepest postseason run since winning the NCAA championship in 2015. Lewis finished last season in fourth place in the MIVA and reached the conference tournament semifinals. 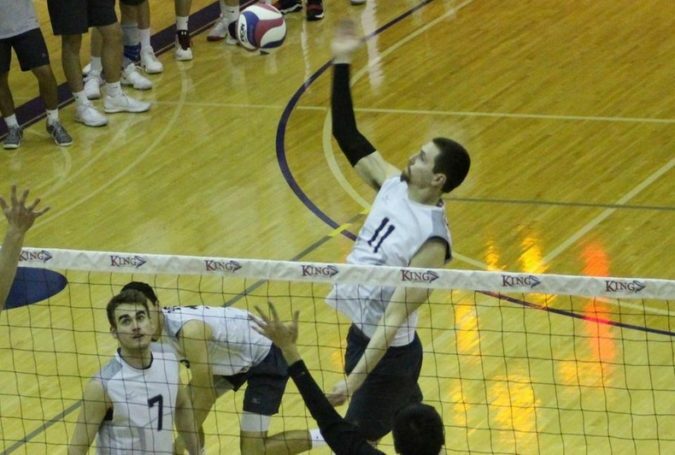 Among the starters returning for the Flyers next season includes All-American outside attacker Ryan Coenen and All-MIVA setter Matt Yoshimoto. Along with their top-10 national rankings, Loyola and Lewis are both undefeated all-time against ConfCarolinas schools.